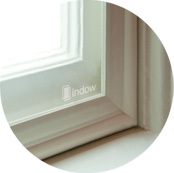 Indow offers six distinct interior window insert grades for our custom storm windows, all of which block drafts and reduce outside noise. Each grade is made from durable, continuously manufactured acrylic with its own special superpower such as UV protection, enhanced soundproofing, privacy and more. Are any of your windows an unusual shape? Don’t worry. Our inserts can be made to fit them. 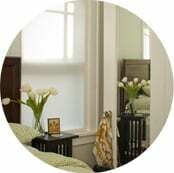 Our acrylic interior storm windows are durable, lightweight and blend in with the surrounding frame. Don’t buy new windows. Make the ones you have just right. 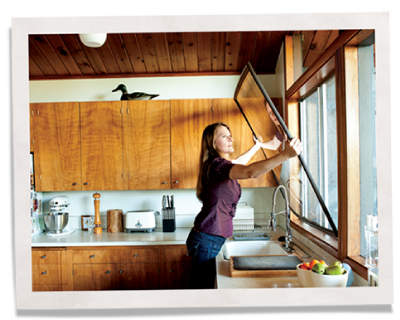 Our workhorse interior storm window insert blocks drafts and reduces outside noise. Twice as thick as Standard Grade, Acoustic Grade provides superior window soundproofing. UV protection for your furniture and artwork with the same clarity as our Standard Grade. Obscure what’s happening within to maintain privacy while enjoying plenty of light. Blocks all light for better sleep and helps those with light sensitivity and migraines. 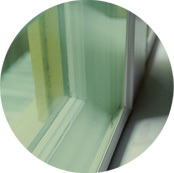 Our scratch-resistant window inserts are perfect for commercial settings or busy homes. Shade Grade’s pleasing soft green tint lets in light while blocking out excess heat. 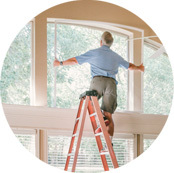 Wonder how our interior storm windows stay in place? Our patented silicone compression tubing makes an airtight seal between the insert and window frame, securing them firmly in position. Still, they’re easy to take in and out. 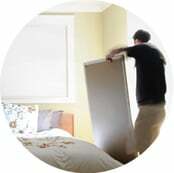 Inserts up to 14 square feet can be comfortably handled by one person. To discuss the size of your windows and get an estimate on cost, fill out the form below.